Any type of restoration should focus on improving the safety as well as the functionality of the object. For lighting, there have been major improvements in the last few decades in polarity and quality of materials. 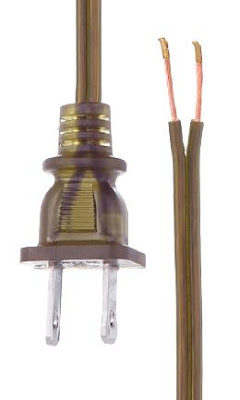 The plastic on mid-century lamp cords can deteriorate and crack exposing the wire. Today's plastics and insulation are much more durable and efficient. The term lamp repair covers a large spectrum of possibilities from replacing a socket in the latest Flea Market find to complete restoration of a crystal chandelier. Knowing what parts to keep and what parts to replace can be tricky. As a general rule, we replace any wiring that might be over 20 years old. Newer wire can stay as long as it is polarized (plug has one small and one wide blade and the cord has one smooth wire and one ribbed wire) does not have any cracks, rubs, or exposed wire. 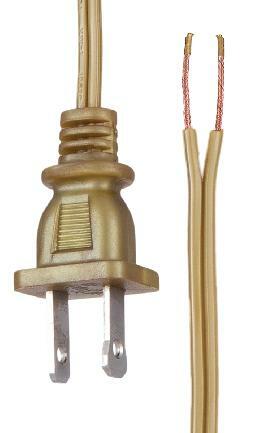 Specialty lighting shops, like Antique Lamp Supply, offer a large selection of lamp cord in different colors. You don't have to sacrifice the vintage look of a cord for a newer safer cord with a polarized plug. New lamp cord colors like antique brass, unfinished brass, and antique bronze help match an older fixture's finish. Sockets are a little more complicated. There are several things to consider including size, age, functionality, and condition. As this blog has touched on, there are different size sockets available. In the US, for example, we only use 4 (E12, E26, E39, and GU24). If a lamp needs repair and it has an uncommon socket, it is getting replaced. For every repair we check the socket functionality. If it does not work properly it is going to be replaced. Occasionally, some corrosion can be removed and improve the socket's performance. Sockets are small mechanical parts and they were not designed to be repaired easily. The age of a socket would normally correlate with usage and material. As mentioned earlier, plastics made in the early to middle part of the 20th century have proven to deteriorate and are probably not safe. Some early sockets were made with porcelain interiors. With some simple tests, you can determine if the socket interiors can be reused. Test the socket interior with an ohmmeter. Remove the socket interior from the socket shell and remove any wire on it. Touch the one line of the ohmmeter to the center tab inside the socket. Touch the other line to a screw terminal. Turn the socket switch a few times. If the ohmmeter does not react try the other screw terminal. The ohmmeter should indicate the screw terminal that links to the center of the socket and the switch is properly opening and closing the circuit (switching on and off). After you have identified the screw terminal that matches the center of the socket, mark the screw with a paint pen or marker. This establishes the polarity of the socket. Modern sockets have a nickel and brass screw terminal. The hot wire (smooth wire of a cord set, black wire, or wire that correlates to the small blade of a polarized plug) connects to the brass screw and powers the center tab of a socket. 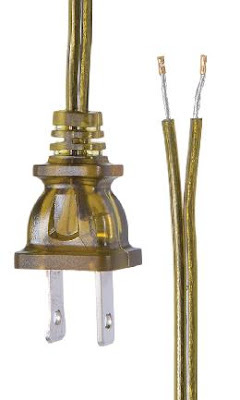 Older lamps did not have polarized sockets, plugs or wire. With a new paper insulator, this socket interior is tested and ready to be reused.